All transactions are safe and secure with a reliable history in online purchasing behind each of our associates. Buy the Hannah Montana Costumes and Wigs to own Hannah Montana clothing and merchandise. Capture the persona of your favorite teen superstar with these Hannah Montana costumes and accessories, including signature gloves, wigs and headsets. Grab your microphone and sing along in a Hannah Montana Lola costume or dance to the beat in Hannah's movie dress. With numerous versions of the popular character to choose from, you'll surely find your favorite. 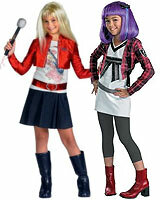 Combine the costumes with your favorite Hannah Montana t-shirt for the perfect pop star ensemble. In addition to the Hannah Montana Costumes and Wigs above, browse the Hannah Montana Clothing Gallery for more apparel like men's and women's clothes, kids shirts or hoodies.